Around 1990, hearing aid manufacturers routinely developed devices that would automatically capture softer inputs (sounds) to provide extra enhancement (more volume) while at the same time, reducing amplification (volume) for louder inputs (sounds) without any digital enhancements. In 1996, the onset of 100% digital processing brought about the use of noise algorithms (mathematics) that would analyze incoming sound signals and automatically adjust the emphasis of the amplification. In addition to the digital sound, basic feedback control measures were also introduced. In the first decade of the 21st century, the speed, precision, and refinement of the noise and feedback algorithms increased hearing aid wearer satisfaction significantly. The clarity of the signal became sharper, crisper with the enhanced frequency bandwidth. This enabled the devices to capture more high frequencies, which allowed the hearing impaired patient better understanding due to consonant sounds being more audible. Around 2007, “connectivity” was another route to improving a patient’s hearing through assistive devices designed to capture blue tooth signals and “stream” (broadcast) the signal directly to a patient’s hearing aids. Cell phones or other signals that are converted to Bluetooth are streamed into the aids, thus reducing distance issues and allowing the hearing impaired to be “hands free” with their cell phones. A wireless microphone can also be used to send the sounds directly to the listener’s ears! Now jump to 2013…the future of hearing technology is bright! One leading manufacturer improved connectivity through refining the durability and simplicity of the devices. This same company has developed noise samples to recreate various listening environments to assist in the fitting/rehabilitative process, while improving the speed of analyzing the incoming signals. Another research approach, attacks the root of many hearing aid wearer’s major complaint, “I can’t hear in noise”. The goal is to recreate the sounds of the world as true to life as possible without peak clipping or input compression (2 strategies routinely used in the devices to prevent the circuitry from “overloading”). Raising the ceiling on the incoming signals allows the device to process the cleanest signal possible thus reducing the “noise” and allowing the hearing aid wearer clearer sound and better understanding. If you or someone you know has a hearing loss and thought yesterday’s hearing aid technology was clear, just take a listen to what is available today! The age old complaint of not being able to hear in noise has been addressed. If you or a loved one needs hearing aids or are currently wearing hearing aids that are not providing the best quality sound, take the time to listen to the newest hearing aid lines. You truly won’t believe your ears! Why Can I Hear, but Not Understand? When most patients walk through the front door for their first hearing test, it is typically because a spouse or family member has lovingly coaxed them into “finally coming in.” Patients often do not feel that their hearing is impaired. The most common statement that patients utter is, “I can hear….I just can’t understand what people are saying.” When patients state this one simple expression, they are completely correct, in most cases. Presbycusis is the name for hearing loss that occurs slowly over time in most of the population, which affects our high-pitch hearing but leaves our low-pitch hearing intact or less impaired. This high-pitched hearing loss hinders our ability to hear consonant sounds, which are higher in pitch. Consonant sounds are critical for the discrimination or clarity of speech; our ability to discern one word from another. This reduced audibility of consonant sounds will adversely affect our ability to understand speech or mistake words in a conversation. Therefore, if a patient has a hearing loss in the high frequencies, but in the low frequencies hearing is better (or even normal), it gives the feeling of being able to “hear” because one can hear the volume of the speech but they fail to “understand” because they are missing the clarity of the speech. 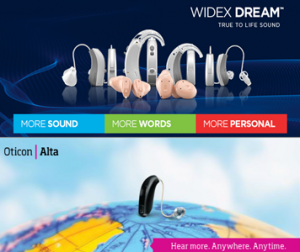 Hearing aid technology has improved drastically over the years in a multitude of ways. One of which is in the fidelity and clarity of the sound reproduction being put into the ear for processing. One challenge in the past was in the hearing aid fitting of patients whose hearing was drastically worse in the high-pitches versus the low. The reason why this was a challenge is because when hearing falls below a certain point, the integrity of the auditory (hearing) nerve is also greatly diminished. When the nerve is impaired, distortion of sounds may occur even when the appropriate amount of amplification is provided for the severity of hearing loss present. Technology, known as frequency (pitch) transposition or frequency shifting has made it possible to provide the appropriate amount of correction for high-pitch hearing loss without causing the distortion of speech that occurred in the past. This technology alters where in the hearing organ specific sounds are being presented for processing. This allows areas of better neural integrity to process the high-pitched sounds instead of the damaged areas. Frequency transposition technology has been shown to greatly improve patient’s abilities to discriminate and understand speech in typical presbycusis type hearing losses of certain severities. If you or someone you love suffers from any of the symptoms described above, please take the time to consult a Doctor of Audiology, Au.D. or a Doctor of Philosophy in Audiology, Ph.D., who is specifically trained to identify, diagnose, rehabilitate and monitor disorders of the hearing and balance system. If hearing aids are recommended or if a previous experience with hearing aids did not meet your expectations, you should make sure that you schedule an appointment with a reputable audiology practice that will offer a free listening demonstration and offer you the opportunity to “hear” how the devices can improve your ability to hear and understand before making a decision.